Made & Told, the brainchild of Mary Mitchell, is a unique online concept that supports artisans across Central Asia. Mitchell, a journalist and filmmaker who has worked in Central Asia, is committed to promoting and supporting traditional craft from the region. What makes her concept so special is that alongside the products, mainly home wares, there is an accompanying video so you can watch the making of the item and listen to the artisan's story. All the products are sourced directly from artisans, and 50% of the profits are donated to organisations working with artisans and entrepreneurs in Central Asia. Mitchell's goal is to generate income for craftsmen and women and give them the opportunity to have their stories heard and their work admired worldwide. The online Uzbek range includes plates from Rishtan, suzanis from Shakrisabz and ikat from Margilan. 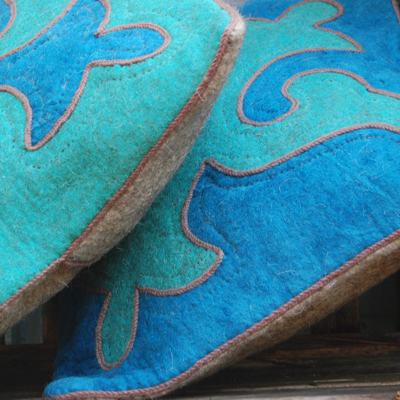 The Kyrgyz cushion covers are either felted or made with antique embroidery. Custom orders are possible now and the product range will expand. International shipping rates are not yet published on the site. However, if you contact Mary Mitchell at info@madeandtold.com she will be able to quote. Do visit the Made & Told shop to view the products and watch the artisans. This is a venture well worth supporting.